You guys, seriously. Ser-E-Us-Ly. How cute is this comic? 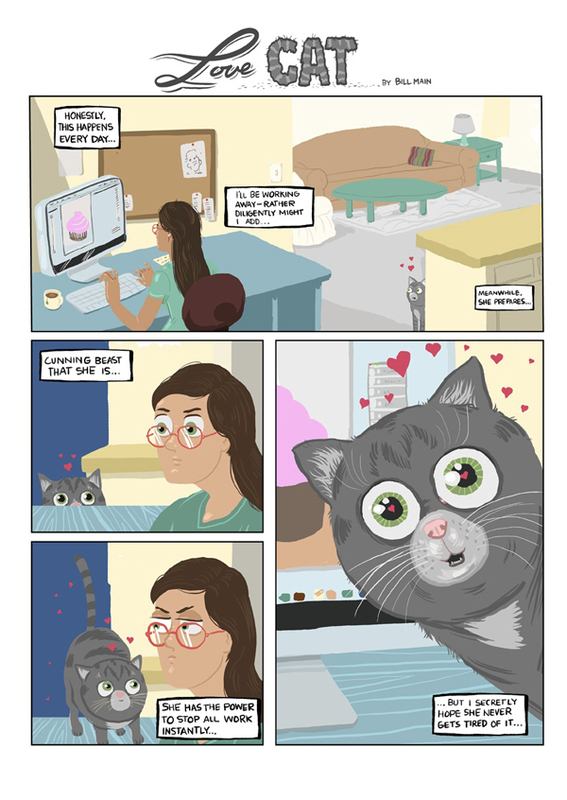 After hearing approximately 56,000 times how annoying our cat Mombi can be during my work day, my husband was inspired to create a little comic depicting the true events that happen. Yeah, sometimes it really rocks my socks off to be married to an artist. I mean...LOOK AT THIS GLORIOUS and SUPER CUTE thinnnnngggggggg!!! AGGAGGGGAGAGHHHHHH! This guy really blows my mind. He'll have an idea, develop it all lickity split, and them WHAM present me with this truly amazing piece of artsy work. So artsy that I just have to get up and kiss him immediately. Like the time we watched Parks and Recreation for 3 weeks straight, stopped all responsibilities and did nothing else. Muuuust keeeeep watchinnnggg theee shooowwwww... He all of a sudden had this idea for a Ron Swanson painting. BOOM! a week or so later, he's done. The events in the comic are so real, it's truly...comical (see what I did there?) They indeed did and do continue to happen. They happen every single day, like clockwork. Every day. You'd think Mombi Girl (a.k.a Love Cat) would tire of jumping up on my desk, rubbing on my computer, stomping on my keyboard, and swatting at my cursor which happens to be moving across the screen (all day long). Nope. Nothing inside of her shows any signs of stoppage. Also included? Snuggling on my lap, followed by seeing something interesting out the window- to which she needs to get up, walk across keyboard and check out. 2 minutes later- back to my lap. We play this little game about 20 times a day. Oh, did I mention with her love comes about 5 tons of cat hair? All over. It's amazing how much this cat sheds. You'd think she'd be nakie by now, but nope! Plenty of hair to go. I may or may not have embellished that last part a bit. Cats. Gotta love them, right? Oh I do though. I love my two cats so ridiculously much. It truly is ridiculous. I AM THAT CAT LADY. Ask any one of my friends. No really, ask them. "What's that Mombi? Tap water makes you barf? Aww filtered water it is!" "Oh what, Mustachio? You only like eating the top quality cat food and require it twice a day?? Sure!" "Oh no problem Mombi, I would love to give you some of our chicken dinner because you're meowing so cutely and clawing up my leg." "We definitely bought that couch for your clawing pleasure, Mustachio. Oh and that million dollar cat tree? Don't worry if you don't want to use it instead." Today we've reached a very happy compromise. 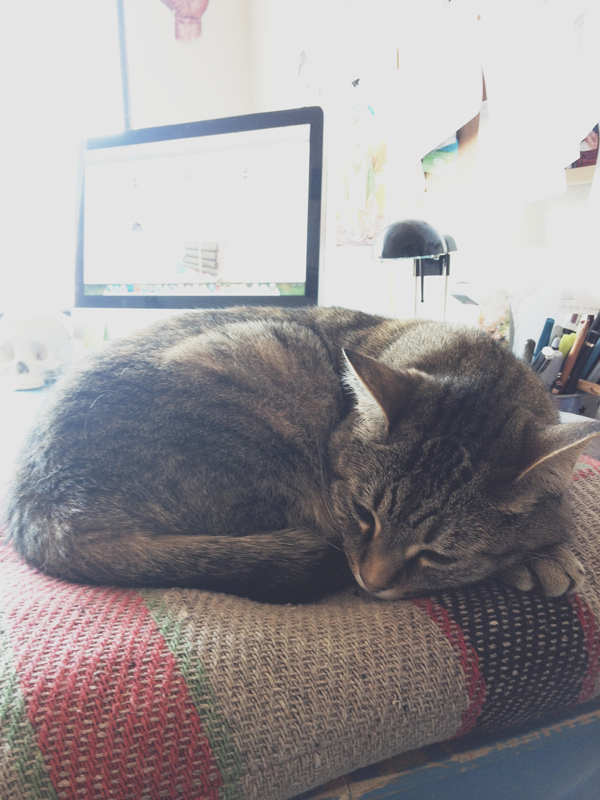 I have given up half my work desk. In return she has promised to stay on her pillow and sleep. Now as for this comic, it's getting printed and framed, stat! Success!